After the Scarlet Tanager and host of other birds at Jamaica Bay on Sunday I thought I would wander across Cross Bay Boulevard and see what was happening on the East Pond and at Big John’s Pond. Upon my arrival at Big John’s Pond there was one other person in the blind and he kindly pointed out for me a Wilson’s Snipe working the bank of the pond immediately to the left of the blind. It was great to get such a close look at a snipe but it was immensely frustrating that the bird was mostly obscured by leafy branches. Shortly after showing me the bird the other occupant of the blind left, leaving me alone with the snipe, which was slowly working its way further left where I saw it would eventually come to a section of bank unobstructed by branches. So I waited. Patiently. 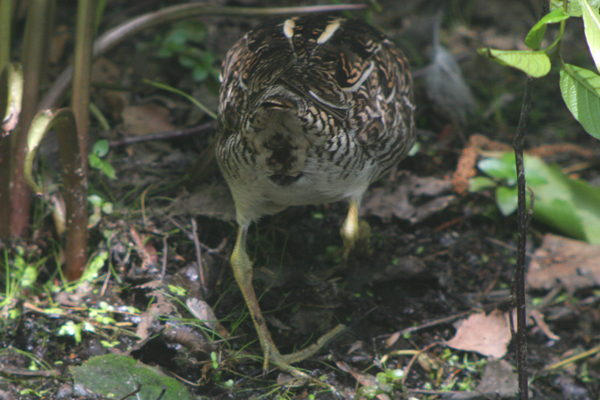 Very, very, very patiently, it turned out, because this snipe did not want to make things easy. Fortunately, a female Gadwall let me take some shots from rather close range but Gadwall just are not as interesting as snipe so I found myself continuously peeking over at the snipe to make sure I hadn’t missed it wandering out into the open. Then the Gadwall went into cover and left me still awaiting the snipe’s movement into the open. When the snipe reached the very edge of the area where it would be clear of obstructing branches it sat down and closed its eyes. Aaaarrrrgggghhhhh! 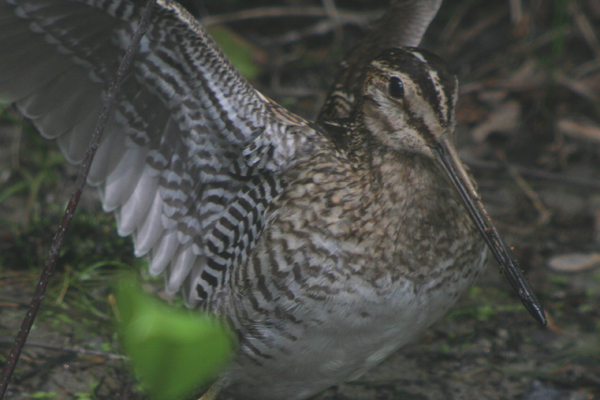 I briefly considered throwing rocks at it to get it moving again but it seemed that the snipe sensed my malicious intent because it suddenly stood up and moved into the open and put on one heck of a show! 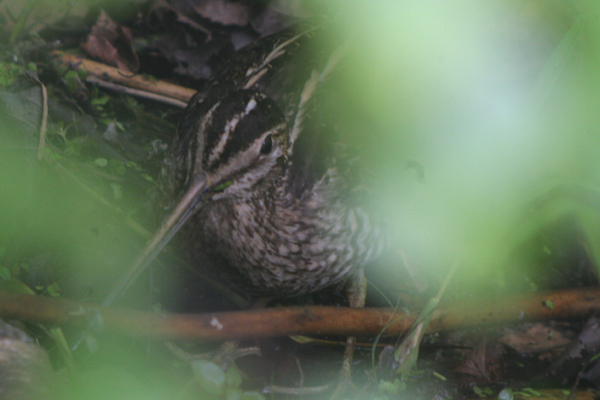 When I left the snipe was once again going behind some bushes, but I told a birder coming in where the snipe was. I wonder if they waited as patiently as I did, and, if they did, if they were rewarded as well? This post has been submitted to Bird Photography Weekly #40. Go check it out! Kinda late for a Snipe down there isn’t it? 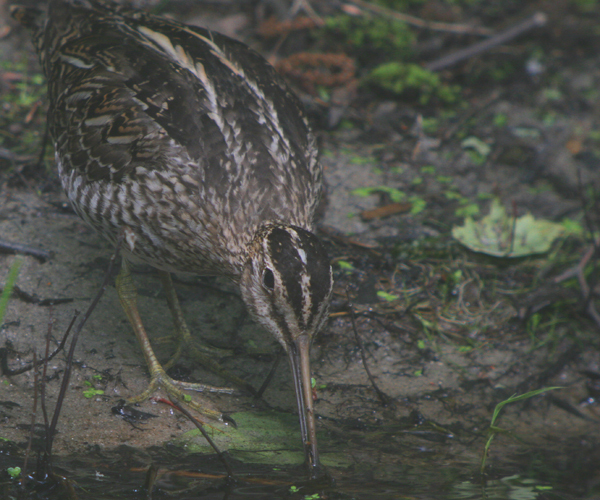 Wow, Corey, these are really up close shots of the snipe! Patience indeed paid off. @Will: Those beaks go deep…dangerous little critters when they join the ranks of the undead. 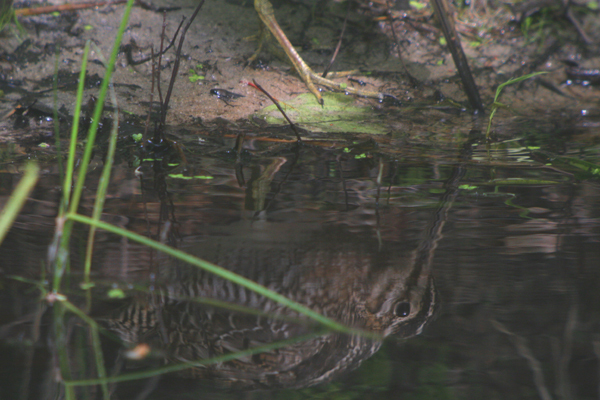 @Mary: I might be known to give up and wander on occasionally but a chance at good shots of a snipe is hard to come by. @bob k and MaineBirder: Thanks! Great captures of the Wilson’s Snipe Corey! I can soooo identify with your situation. So many times I have waited for over an hour to get a shot and as soon as I gave up, the bird would come out or do something fantastic. I have come to realize that bird photography is definitely a planning and waiting game. Is it only me, or do birds seem to have plenty of free time to hang about waiting for photographers to leave ;-)? So well worth waiting for and giving us this absolute treat. It has such beautiful markungd on its wingd when clodes, justgreat ziz-zag effect. I have a question about Snipes. This spring we were in Yellowstone, and saw several. 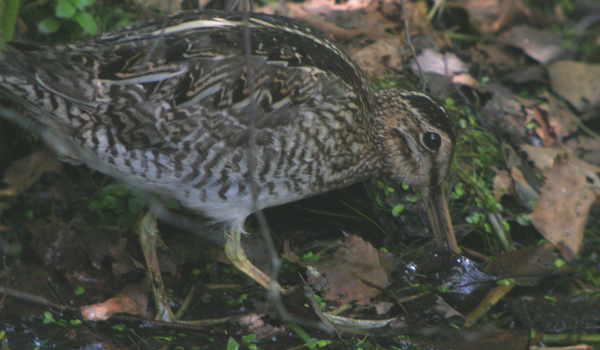 The Peterson Guide and the Sibley Guide both show only Common Snipe (Gallinago gallinago). The ABA checklist I downloaded for my Year List shows Common and Wilson’s (G. delicata). Is this a recent development? Do you know of a field guide that shows both species with distribution so I can tell which one I saw? Is there a good website for identification? 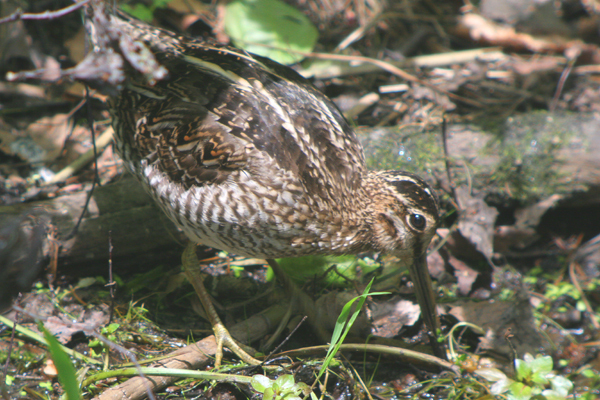 Peggy, the two snipes were until fairly recently both called Common Snipe, but were split into Wilson’s (G. delicata) and Common (G. gallinago) by the American Ornithologists’ Union in 2002. Some authorities haven’t followed the split, but most have. 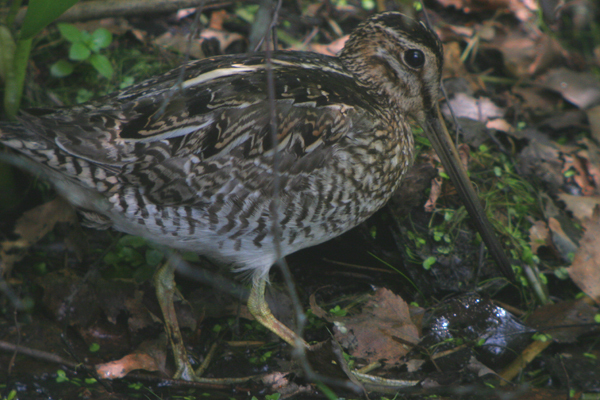 The bird you saw will be Wilson’s – the Common Snipe is found across Europe and Asia and is only recorded with any regularity in the US as a passage migrant through the Aleutians (though a pair of Commons apparently bred on Attu in 1984).